The PODV9CPT from Panasonic is an Outdoor vandal resistant pendant mount with dome housing. The PODV9CPT is also equipped with 24 VAC input blower and thermostatically controlled heater. 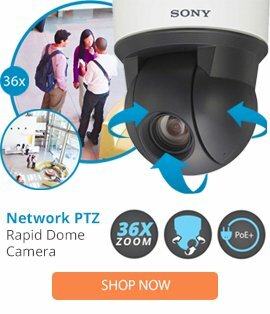 The PODV9CPT is an outdoor vandal resistant dome housing forWV-CS954/WV-CS574/WV-NS324 unitized dome camera systems. The housing top and pendant mount bracket in the PODV9CPT is constructed of strong cast aluminum. The dome is made of an injection molded, optically clear, polycarbonate blend material. The PODV9CPT features a 24 hour fan operation for effective heating and condensation protection and includes thermostatically controlled 24VAC heater. The PODV9CPT requires separate power input for H&B and camera power. The PODV9CPT offers surge protection for video line and power line. The PODV9CPT is made up of optically clear dome material. The PODV9CPT is easy to install.